What Type of Damage Can Happen to Your Property’s Sewer Pipe? Of course, homeowners can’t see the sewer lines that are connected to their homes. As such, more often than not, they don’t spend a great deal of time worrying about what kind of condition they’re in. Nonetheless, it doesn’t take people very long to figure out when there’s a problem with a sewer line. In some cases, it’ll only lead to slow moving drains in a home, but in others, it’ll result in raw sewage backing up into a home or spilling out into a yard and making a huge mess. Take a look at some of the damage that can happen to a sewer pipe over time. Trees can cause sewer pipes to break. Is there a large tree growing in your front yard? There is a chance that it could wreak havoc on your sewer line over the years. It’s not all that uncommon for the roots from a tree to grow into and around sewer lines and cause them to break. When this happens, at least some of the wastewater leaving your home will spill out. 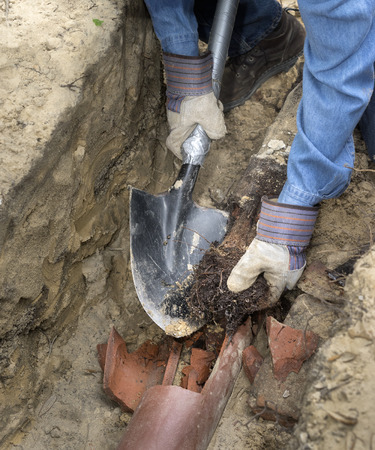 Tree roots can also cause sewer lines to get backed up. Debris can cause sewer pipes to clog. There is a long list of things you should not flush down a toilet or put down a drain under any circumstances. If you ignore the list, it could lead to debris building up in your sewer line over time and making it almost impossible for wastewater to pass through it. This is when you’ll need to worry about sewage backing up into your home. You’ll need to have your sewer pipe cleared to prevent this from happening. Age can cause sewer pipes to crack. Sewer lines aren’t meant to last forever. Old clay sewer pipes were designed to last for about 50 years, while newer PVC sewer pipes were made to last for about 100 years. As sewer lines get up there in age, it increases the chances of them cracking and wearing out in other ways. When it gets to that point, the sewer pipes will need to be replaced to get them back into good working order. Prior to purchasing a home, you should always have a sewer pipe inspection completed. It’ll let you know what kind of condition a sewer pipe is in before you invest in a piece of property. Cornerstone Home Inspections specializes in conducting sewer pipe inspections. Call us at 800-648-6187 today to schedule one. CLICK HERE AND LEAVE US A REVIEW!